Come celebrate with us at a delicious fundraiser! We had our first product launch at the Grand Central Oyster Bar on January 20th 2011 to celebrate Executive Chef Sandy Ingber and his commitment to the Peconic Pearls Environmental Program! The Noank Aquaculture Cooperative is partnering with Captain Libby Koch of H2O Hospitality for tours of our oyster farm. All tours are about 1.5-2 hours. They include a tasting of our Peconic Pearls oysters and a boat ride to our cultivation grounds. Join us for a private tour of the shellfish facility at Shellfisher Preserve. Visit the Noank hatchery, nursery and grow-out operations and learn how the shellfish are spawned indoors, become microscopic shellfish larvae, and eventually grow to be the Peconic Pearls oysters you love to eat! During the second half of the tour, Captain Libby Koch will take you for a boat ride aboard the Category 1 for a tour of the shellfish cultivation areas in Southold Bay. Weather permitting, guests can rest on the beach near the Cornell Cooperative Extension of Suffolk County’s grow-out site. The tour ends with an oyster tasting (feel free to bring along your own alcoholic beverage for pairing). Weather permitting, tastings will take place by the bay. In this half-day experience, you and your party will learn about shellfish cultivation, water quality issues that affect the bay, and stewardship of the estuary. 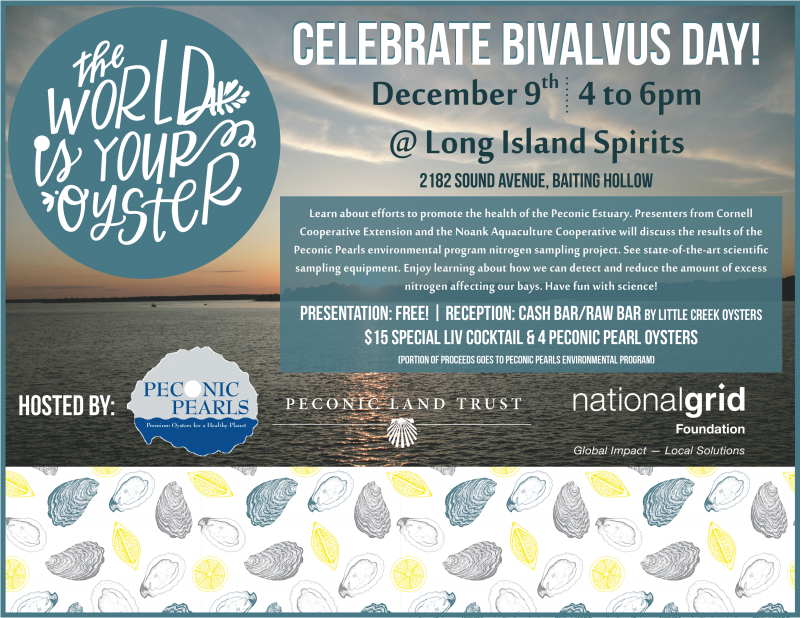 Peconic Pearls are grown to look pretty, to taste great, and best of all to raise proceeds for projects benefiting the Peconic Estuary. Tickets are very limited, so book a tour today! Paumanok Vineyards on weekends, see website for scheduling. Paumanok is a supporting member of the Noank Aquaculture Cooperative.